Canada's Tara Whitten has secured her second gold medal at the track cycling world championships, winning the women's point race final on the last day of the event at Ballerup, Denmark. Whitten, of Edmonton, earned 36 points to beat second-place Lauren Ellis of New Zealand by three points. Tatsiana Sharakova of Belarus took the bronze. 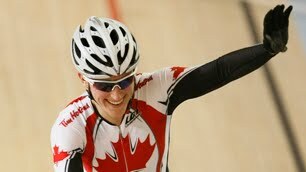 Whitten also won the omnium event on Saturday, and said she was surprised to get a second gold. "I didn't think I had anything left after winning the women's omnium yesterday, so I'm thrilled," she said.